The extensions catalog was introduced in DotNetNuke 6 and is designed to be an easy way to discover, download and install new extensions to your site. 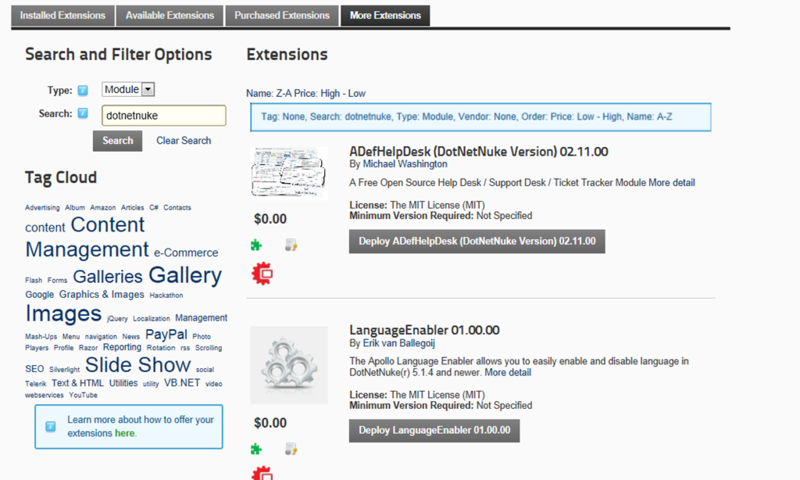 The extensions catalog integrates data from the DotNetNuke forge and SnowCovered into one centralised catalogue, and adds rich searching (by tag, extension type, vendor and text search across extension name and description) and ordering capabilities (by Name and price -particularly handy for looking for free extensions) . To access the extensions catalog, Host users just need to go to Host->Extensions and click on the “more extensions tab”. This will display a screen similar to below allowing for users to easily locate the extensions they need, displaying them in a list (with infinite scroll so as you move towards the bottom of the list the extensions catalog will seamlessly pull in any more records and display them). As well as locating new extensions, the extensions catalog has an “instant-on” experience built in. If an extension comes from the Forge, a deploy link will be shown that can be clicked to download and install the extension, all without having to go out to codeplex.com to locate it and no more need to download and then upload the zip file as the extensions catalog handles all of that for you. If it’s a SnowCovered.com extension then a buy link is displayed which redirects the user to the appropriate snowcovered.com page and add’s the extension automatically to the basket. Once the extension is purchased, you can then go back to the Host extensions screen and click on the “purchased extensions” screen (after you’ve supplied your SnowCovered login credentials) and generate a list of orders you have access to. At this point it’s possible to download the extension and if the SnowCovered vendor has indicated that it’s deployable (e.g. does not require any additional steps such as extracting zip files from within a zip) then a deploy link appears allowing for friction-free installation.